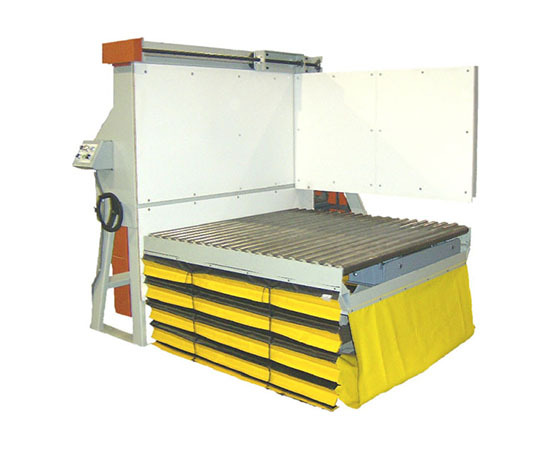 Systec's Unit Load Downstacker (ULD) is an ergonomic solution for manual load forming stations. Conveyor table can be elevated to a comfortable work height allowing the operator to transfer bundles of boxes from the bundle conveyor to the ULD station without bending. As each tier is completed, the operator can activate the lift, lowering it to a comfortable work height, to add the next tier of bundles to the unit load. As the lift is actuated for movement, the stationary and adjustable backstops retract for load clearance. Once the lift has been stopped, the backstops return to the original position for continuation of load building. The ULD adjustable backstop can be adjusted to position the unit load as required, and minimize the effort.